Give hot cocoa a touch of holiday flair by melting crushed candy canes in the cocoa and serving it with a candy cane 'stirrer' stick and fluffy dollop of whipped cream. Heat milk until hot, but not boiling. Whisk in chocolate and crushed candy canes until melted. 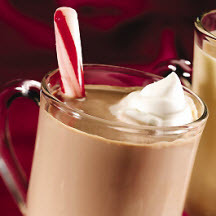 Pour into four mugs; top with whipped cream and garnish with a candy cane.